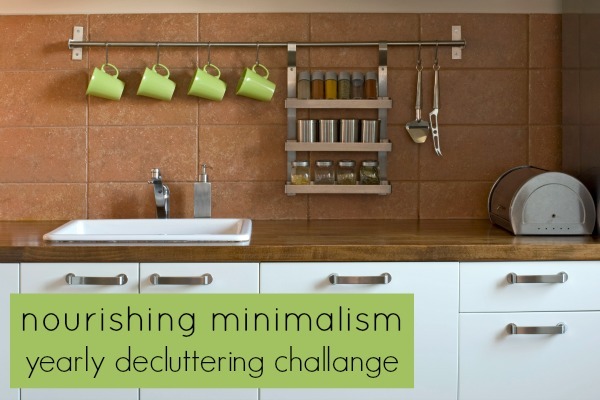 Welcome to the Nourishing Minimalism Yearly Decluttering Challenge! We are decluttering 2018 items in the year 2018. Join over 22,570 subscribers and participate in the Yearly Decluttering Challenge: Declutter 2019 Items in 2019! The rules are your own: If you have a stack of magazines to get rid of, you may count it as one item, or you can count each magazine as an item. You may even guess the number! The point is just to get rid of it. Keep the chart on the front of the refrigerator or a cupboard where you can watch your progress and keep motivated. If you have children, get them involved! Let them mark the boxes. Use different colors for different family members so they can see how much they contributed! Plan out a celebration after each hundred is reached. Thank you. I’m looking forward to decluttering in 2015! Click on the yellow button, enter your email address and the chart will be sent to your email right away. If you haven’t seen it, check you junk or spam folder in your email. I follow those directions and am sent in a continuous loop of clicking the link and the yellow box and entering my email. Even tried a second email. CANNOT PRINT THIS CHART! I’m so sorry you’ve had issues Cassandra. You can check your spam folder, or any other mail folders, or you can email me and I’ll send you the file. I’m having the same issue, it keeps bringing me back to this page & wants my e-mail address. Feel free to email me and I can send you the file. If you click the yellow button and enter your email the file will be sent to your inbox. (Check your spam folder if you don’t see it) I wasn’t able to attach a file directly to the newsletter email, so this is the way I had to store/send the pdf. I signed up for sheet but got subscribed and no sheet. Link to get sheet starts process again. One email not two. Looks good but would like to look at sheet but nyeh. Check your spam or junk folder. It will probably be there. I checked my spam folder and it’s not there. You can search for “2015 in 2015 Chart” (that the title of the email) and if you can’t find it, just email me by replying to any of the emails you have gotten from me. I got the email, but it just links me back here asking me to subscribe to the newsletter again. Still can’t get link. I’m totally doing this for 2016!!!! It’s May 23rd and I live in a small 1 bedroom apartment but I think I can still get 2016 things out of here and make space for the things I really want to do. I started 3 weeks ago before I found out about your challenge. I have already thrown away 3 large black trash bags of old clothes. Some of the clothes given to me were already used when I got them 8 years ago. Some I’ve had a lot longer. I figured they were long past an expiration date, so they are now buried in the land fill. Thanks for your encouragement. Thank you! Looking forward to filling in all of the 2017 spots this year! Happy new year! I never thought of my depression and anxiety as the reason for my clutter. Thank you for letting me know I really am not crazy. Now I have pruff to show my sister’s. Thank you! What about incoming kids art, junk mail, etc? Do those items count? I’m a regular decluttering gal so I don’t even think I have this many items! I agree with Cathy about your stuff and his stuff. Every time we moved one whole extra rooms was all for my husbands stuff. ie. clutter. Except One end table in the living room he agreed to, as I did, to keep the rest of the house picked up and uncluttered. I thought when we moved he would have gotten tired of moving all the stuff in his room but he never did. For some people it is about loss from their childhood or a space in themselves that was never fulfilled. HE WAS NOT A HOARDER. Being a minimalist your kids will appreciate it. Set aside extra money and give it to the adult child that understands your efforts. Many people use 1 800 Got Junk that will help them clear out homes storage units and make the process much easier for everyone. I hope I have joined really need to get this done. Hi! I signed up but the chart I received is for 2018. Can you please help with this? I signed up and didn’t receive the chart. Checked spam and trash.